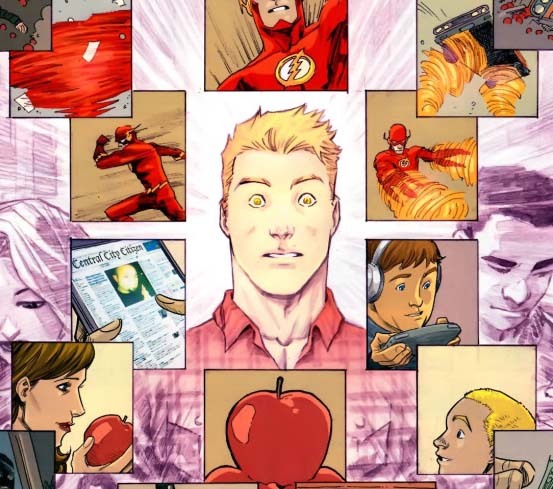 Considering all of the changes seen in DC’s New 52 Flash title, the reemergence of the character’s roots in cutting-edge science has received nearly as much, if not more, attention than the tweaks to beloved characters and the series’ long-set standards. The prime example of this has been the introduction of a very real concept know as Augmented Cognition, or AugCog. 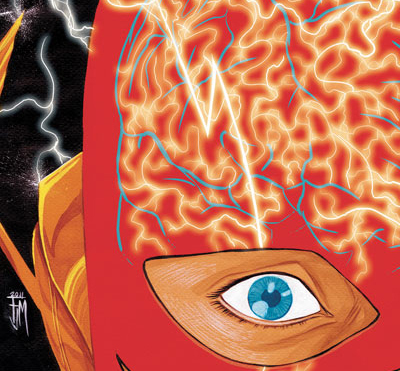 In Flash, Barry Allen is advised by new character Dr. Darwin Elias to apply his use of the Speed Force to his brain, allowing him to use his powers to affect perception and the processing of information. 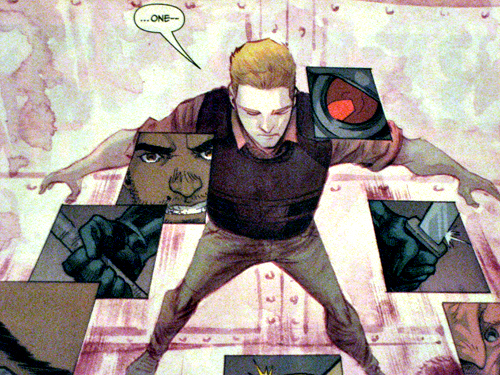 This new power was on display in full force in issue #2, and lead to the chilling cliffhanger ending of issue #3. Q: Flash #2 describes Augmented Cognition as “a neuroscience focused on expanding the limits of human brain cognition.” A character in the book suggests that Flash can access the source of his super-speed powers, the “Speed Force,” in order to “…eliminate the natural bottlenecking of information that occurs due to the limits of human physiology.” How accurate do you feel this description is? DR. P. A. HANCOCK: This is actually quite a reasonable suggestion. The question is: why are there bottlenecks in the first place and what evolutionary cause do they serve. There is some highly intriguing work which passes visual images very quickly (just a few milliseconds) past a human observer and then their brainwave recordings are used to help a computer to sort which images have likely targets. Thus, the brain here filters at a tremendously high rate (better than many computerized search algorithms), and the output can then be surveyed more slowly as the actual targets are determined consciously on-screen. How is it the brain is able to work this quickly and yet consciousness struggles to keep up? I think this is one of the conundra that augmented cognition is looking to investigate and potentially ‘solve.’ Although whether we will like the solution is also the matter of much discussion. Q: As a board member on the Augmented Cognition International Society, can you tell us about your role, and some of the implications and possibilities of Augmented Cognition? PH: In the past, my main function has been associated with Conferences and serving as a referee on submitted papers, and of course attending a number of these Conferences alongside my students and colleagues. One of the issues that has always intrigued me is why people are so slow at learning [note: see ‘Can Technology Cure Stupidity?‘]. It has been suggested that the natural ‘design lifetime’ of a human being is about 23 years of age (about the time we get out of College!). While I like the idea of lifetime learning, why are the methods we have of information transmission to humans (learning), so slow? It echoes the element in the ‘Matrix’ where individuals are able to assimilate expert skills in seconds. Radical changes in our timescale of learning would have profound implications for all of human life – it is one issue AC can address and help with. Q: Flash uses his new-found abilities to sort through possible outcomes at super-speed and make split-second decisions with complete certainty. Some of the areas addressed on the Society’s website include “…limitations in attention, memory, learning, comprehension, visualization abilities, and decision making.” In your option, how could someone operating at super-speed use access to Augmented Cognition to achieve a nearly “precognitive” state? PH: Humans have already evolved to use such abilities. You don’t need to react at ‘super-speed’ if you can anticipate. This is, in part, what the prefrontal cortex is for – ‘getting out ahead of time.’ [see ‘Battle for Time in the Brain’]. Most of our memory is now being ported to the external technology (e.g., web sources etc). Soon, we will have a growth of equivalent ‘apps’ for certain forms of decision-making (they will come in as advisories, e.g., ‘what should I eat and where today? ), the big issue will be attention. We still don’t know enough about attention and the current theories need to be revised. Part of the answer may be biochemical as much as neurocognitive solutions. Neuroscience promises much but progress is actually slow because this is a such a difficult problem. ‘Super-speed’ is also relative. Once everyone works at that rate it will just be the new ‘normal.’ ‘Pre-cognitive’ will simply mean knowing much more concerning the world about you. You can argue people show vast individual differences in this form of ‘awareness’ now. Q: Does a concept such as “AugCog” redefine “decision,” and if so, how? PH: I don’t know what AC ‘defines’ decisions as but in my mind they are inflexion points in space-time and for humans they are irregularities in their personal (Minkowski) space-time line. One can define a decision to be at a trivial level (e.g., to breath in is potentially a ‘decision’) but I think AC focuses on the ‘cognitive’ level. Even here we talk of ‘skills’ ‘rules’ and ‘knowledge’ to parse decision levels. Also, there are merging ‘camps’ of decision making combining the ‘heuristics and biases’ approaches with the ‘recognition-primed decision making’ (RPD) approaches. It’s an exciting time in this particular field. Q: Are you a fan of comic books, or science fiction? Augmented Cognition seems right at home in a Flash comic book, but is also grounded in 21st Century reality. In the 1950s, when this version of the Flash first appeared, much of the science on display was more “psuedo” than science. How does it feel to be operating on the very edge of current technology and science, and literally keeping pace with science fiction? Q: Now that AugCog will be playing a prominent role, will you be picking up Flash next month? PH: If you can find a place in the next story for a short, fat, ugly, ex-English (now American) scientist who can help Flash with some crucial Aug Cog problem – I’m there. – Can Technology Cure Stupidity? – Can You Trust Your Robot? You can also go to Dr. Hancock’s own website for even more. Keep your eyes peeled for exciting follow-ups to this interview! This entry was posted in Interviews and tagged Augmented Cognition, Barry Allen, Brian Buccellato, Francis Manapul, New 52, Speed Force on December 15, 2011 by Greg Elias. Great interview! A good idea to reach out and a perfect person to talk about the topic. Enjoyed reading that quite a bit. Great Interview, Greg! I can’t believe you got a plug on the Source. That is so cool. Is this what you were talking about the other day? It’s too bad I’m not reading this series. It honestly sounds like a lot of fun. But my grandfather always said, “If you don’t stand for something you will fall for anything.” and I still firmly disagree with the direction that DC decided to take the book in. Wow, just wow. Great job again man. Thanks Devin! Yeah, this is part of it, there will be a couple follow-ups I think…thanks again! Wow! Great interview! Approaching this from a real science perspective was really interesting (and very keeping with the spirit of the Silver Age Flash! The mention of offloading memory into technology is interesting – in a way, we’ve been doing that ever since we learned to write. I remember some history-of-science TV show, possibly “The Day the Universe Changed,” demonstrating how we used to remember things before writing was widespread by enacting a dark ages-era trial which hinged on how old someone was, or how long ago something had happened. A group of village elders cross-referenced their memories of the event: “Well, that was the year before the flood” “The flood was fourteen years ago, I remember because it was the same year that…” and so on. For some reason that left an impression on me: that writing is an extension of memory as much as it is an extension of speech. Thank you for such an interesting interview. Maybe you could do a regular submission and call it “The Scioence of Speed”. I teach science and I want to find more ways to bring comic books into a relevant scientific discussion. Keep it up! Obviously I don’t teach English.